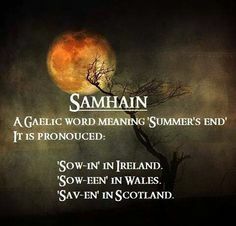 SAMHAIN All Hallows Eve marks the end of the harvest or in some cultures the end of the witches calendar and the beginning of the next. According to their calendar, the year began on a day corresponding to November 1st on our present calendar. The date marked the beginning of winter. The leaves are starting to fall. SAMHAIN Halloween Eve, had its beginnings in an ancient, pre-Christian Celtic festival of the dead. Since they were pastoral people, it was a time when cattle and sheep had to be moved to closer pastures and all livestock had to be secured for the winter months. Crops were harvested and stored. The date marked both an ending and a beginning in an eternal cycle. The festival observed at this time was called Samhain (pronounced Sah-ween). It was the biggest and most significant holiday of the Celtic year. People gathered to sacrifice animals, fruits, and vegetables. Cakes were made and tables set to invite the spirits of the departed to visit. They also lit bonfires in honor of the dead, and to light the paths of departed souls to the other side. The Celts believed that at the time of Samhain, or All Hallows Eve more so than any other time of the year, the ghosts of the dead were able to mingle with the living. The veil between the two worlds is thinnest at this time and psychic abilities are at their highest peak. So on this Halloween, light a fire, set a place for your ancestors ~~have a feast and some cider and give thanks to all who have gone before and will come after. all hallows, halloween, halloween traditions, love readings, psychic readings, psychic veil, samhain, tarot readings. Bookmark.